Algorithm is a precise instruction for completing a preset act sequence; control in an executable program is transferred according to the algorithm. Application Program is a program coded in MQL4 and used in MetaTrader 4 Client Terminal; it can be an Expert Advisor, a Script or an Indicator. Array - is an arranged set of the values of one-type variables that have a common name. Arrays can be one-dimensional and multidimensional. The maximum admissible amount of dimensions in an array is four. Arrays of any data types are allowed. Array Component is a part of an array; it is an indexed variable having the same name and a value. Ask is the higher of two prices offered by broker in a Two-Way Quote for a Security. Bar is a graphical representation of a price chart. Bar is characterized by Open, Close, High, Low prices, as well as by Volume and Time (see also Candlestick). Bid is the lower of two prices offered by broker in a Two-Way Quote for a Security. Buffer is a memory area containing numeric values of an indicator array. Built-In Function is the same as a standard function. Buy is a market order that defines buying of assets for a security. BuyLimit is a pending order to buy assets for a security at a price lower than the current one. The order will be executed (modified into market order Buy) if the Ask price reaches or falls below the price set in the pending order. BuyStop is a pending order to buy assets for a security at a price higher than the current one. The order will be executed (modified into market order Buy) if the Ask price reaches or rises above the price set in the pending order. Candlestick is a graphical representation of a price chart. 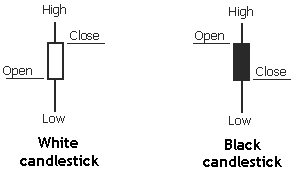 Candlestick is characterized by Open, Close, High, Low prices, as well as by Volume and Time. The can be black candlesticks and white candlesticks (see also Bar). Comment is an optional and nonexecutable part of a program. Constant is a program constituent; it is an object that has a value. Constant Expression is an expression consisting of constants and operations, for example: 2+3*7. A constant expression is calculated at compile time. Control is execution of actions predefined by the program algorithm and by the properties of the client terminal. Control may be transferred within a program from one program line to another, as well as between the program and the client terminal (see Some Basic Concepts). Currency Instrument is a currency pair, for example, EURUSD, GBPCHF, etc. ; it is a particular security (symbol). Custom Indicator is an application program coded in MQL4; it is basically intended for graphical displaying of preliminarily calculated dependences. The values of components of Indicator Arrays of a custom indicator are available to other applications through the function named iCustom() (see also Technical Indicator). EA is an abbreviation for Expert Advisor (see also Script and Indicator). Expert Advisor is a program coded in MQL4; it is distinguished by the properties of special function start() called by the client terminal to be executed on every tick; the main purpose of Expert Advisors is programmed control over trades (see also EA, Script and Indicator). Expression is a sequence of operands and operations; it is a program record, the calculated value of which is characterized by a data type. External Variable is a variable, the value of which is available from the program properties window; it has the properties of a global variable. File Descriptor is the unique number of a file opened by an executable program at the current moment. File Pointer a location in a file where the reading of the next value starts. As the data are read, the pointer shifts to the right by one or several positions. File Separator is a special character; it is a record to be stored in the file to separate data records. Flag is a variable the value of which is placed in correspondence with some events or facts. Formal Parameters represent a list of variables given in the header of Function Description (see also Functions and Function Description and Operator 'return'). Function is a named, specific part of a program that describes the method of data conversion. The use of a function in a program involves Function Description and Function Call. There can be special, standard (built-in) and custom functions (see also Functions and Special Functions). Function Body is one or several operators being the executable part of Function Description. Function Call (or Function Reference) is a record, execution of which results in execution of a function (see also Function Description). Function Description is a specific named part of a program intended for execution; it consists of two basic parts - a function header and a function body; it is used in special and custom functions (see also Functions, Function Description and Operator return and Special Functions). Function Header is a part of function description; it consists of the type of the return value, function name and the list of formal parameters. The list of formal parameters is enclosed in parentheses and placed after the function name. Function Reference is the same as Function Call. Global Variable is a variable declared beyond all functions. The Scope of global variables is the entire program. Global Variable of Client Terminal is a variable, the value of which is available from all applications launched in the client terminal (abbreviated form: GV). Graphical Object - is a shape in the symbol window; the shape can be selected, moved, modified or deleted. GV is an abbreviation for Global Variable of the Client Terminal. Indicator is a built-in function of the client terminal or a program coded in MQL4; the main purpose of indicators is to display Indicator Lines on the screen; indicators cannot make trades; there are two types of indicators: Custom Indicators and Technical Indicators (see also Expert Advisor, EA and Script). Indicator Array is a one-dimensional array containing numeric values that are the basis for constructing of Indicator Line. Indicator Line is a graphical display of a certain dependence based on numeric values included in an Indicator Array. Initialization of Variable is assigning a type-dependent value to the variable at Variable Declaration. Iteration is a repeated execution of some calculations; it is used to note that the program lines composing the cycle operator body (see also Cycle Operator "while" and Cycle Operator "for") are executed. Local Variable is a variable declared within a function. The Scope of local variables is the body of the function, in which the variable is declared. Local Time is the time set on a local PC (see also Server Time). Loop (Cycle) Body is one or several operators included in braces; it is located directly after the cycle operator header (see Cycle Operator "while" и Cycle Operator "for"). Looping is a continuously repeated execution of operators composing the loop (cycle) body; it's a critical situation that results from realization of a wrong algorithm. Market Order is an executed order to buy or sell assets for a symbol (security). A market order is displayed in the symbol window and in the 'Terminal' window until the order is closed (see also Pending Order). Normalized Price is a price rounded off to one Point size for a security (symbol). Operand is a Constant, a Variable, an array component or a value returned by a function (see Function Call). Operation is an action made upon Operands (see also Operation Symbol). Operation Symbol is a preset character or a group of characters that order to execute an operation. Operator is a part of a program; it is a phrase in an algorithmic language that prescribes a certain method of data conversion. There can be simple and compound operators. Operator Format is a set of rules for formatting of an operator of the given type. Each operator type has its own format (see also Operators). Opposite (Counter) Order is a market order opened in the direction opposite to the direction of another market order opened for the same symbol. Pending Order is a trade order to buy or sell assets for a security (a symbol) when the preset price level is reached. The pending order is displayed in the symbol window and in the 'Terminal' window until it becomes a market order or is deleted (see also Market Order). Point is the unit of price measurement for a security (the minimum possible price change, the last significant figure of the price value). Predefined Variable is a variable with a predefined name; the value of such variable is defined by the client terminal and cannot be changed by coding (see also Predefined Variables). Regular Loop Exit is transfer of control outside the cycle operator as a result of execution of a condition placed in the cycle operator header (see also Special Loop Exit). Script is a program coded in MQL4; it is marked by properties of the special function of start() called by the client terminal to be executed only once; scripts are intended for performing any operations that should be implicitly executed only once (see also Expert Advisor, EA and Indicator). Security (Symbol) is the name of the object to be quoted. Sell is a market order that defines selling of assets for a security. SellLimit is a pending order to sell assets for a security at a price higher than the current one. The order will be executed (modified into market order Sell) if the Bid price reaches or rises above the price set in the pending order. SellStop is a pending order to sell assets for a security at a price lower than the current one. The order will be executed (modified into market order Sell) if the Bid price reaches or falls below the price set in the pending order. Server Time is the time set on the server (see also Local Time). Special Function is a function that has one of predefined names (init(), start() and deinit()) and is called to be executed by the client terminal; it also has its own special features (see Special Functions). Special Loop Exit is transfer of control outside the cycle operator as a result of execution of operator 'break' included in the cycle operator body (see also Regular Loop Exit). Spread is the difference between the larger and the smaller price in points in a two-way quote for a security. Standard Function is the same as built-in function; it is a function created by the developers of MQL4, it has a predefined name and predefined properties; the description of standard functions in a program is not specified; properties of standard functions are described in details in MQL4 Reference (see Functions and Standard Functions). StopLoss is a stop order; it is a price set by trader, at which a market order will be closed if the symbol price moves in a direction that produces losses for the order. TakeProfit is a stop order; it is a price set by trader, at which a market order will be closed if the symbol price moves in a direction that produces profits for the order. Technical Indicator is a part of online trading platform MetaTrader 4; it is a built-in function that allows us to display a certain dependence on the screen (see also Custom Indicator). Tick is an event characterized by a new price for a symbol at some moment. Time-Series Array is an array with a predefined name (Open, Close, High, Low, Volume or Time); its components contain the values of the corresponding characteristics of historical bars. Trade Request is a command made by a program or by a trader in order to perform a Trade. The order may be executed on or rejected by the server or by client terminal. Trader is a person that trades on financial markets for purposes of profit. Two-Way Quotes are a connected pair of market prices offered by the broker for buying and selling of assets for a security at the moment. Typecasting is modifying (mapping) of types of the values of an Operand or an Expression. Before execution of Operations (all but assignment operations), they are modified to a type of the highest priority, whereas before execution of assignment operations they are modified to the target type. User-Defined Function is a function created by the programmer (see also Function). Variable is a part of a program; it is an object having a name and a value. Variable Declaration is the first mentioning of a variable in a program. At variable declaration its type is specified. Variable Identifier is a set of characters consisting of letters, numbers and underscore(s), beginning with a letter, at most 31 characters long. It is the same as the Variable Name. Variable Name is the same as Variable Identifier. Variable Scope is a location in a program where the value of the variable is available. Every variable has its scope (see also Local Variable and Global Variable). Zero Bar is the current bar not yet completely formed. In a symbol window, the zero bar is displayed in the rightmost position.